Here’s a recent reality check for me. I ‘ve encountered a few situations where I had to ask myself am I merely toting and quoting the Bible or am I really living and giving like it says? Do others see the Light of Jesus in my speech, actions, and deeds? I realize I need to do more living and giving. It’s easy to tote a Bible or quote a familiar scripture but not so easy to live this Word out so others can see God at work through me. I have no need for band-aids because sometimes the truth just hurts. I am learning most of the time the truth heals if I am willing to follow after God’s will. 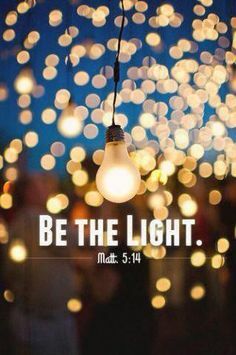 How are you letting your light shine? 13 “You are the salt of the earth, but if salt has lost its taste, how shall its saltiness be restored? It is no longer good for anything except to be thrown out and trampled under people’s feet. 14 “You are the light of the world. A city set on a hill cannot be hidden. 15 Nor do people light a lamp and put it under a basket, but on a stand, and it gives light to all in the house. 16 In the same way, let your light shine before others, so that[b] they may see your good works and give glory to your Father who is in heaven.